October 1st!!!! October is always my favorite month of the year. It is a beautiful month in Michigan. What better way to ring in my favorite month than with a little quilt...Speck!! Speck is a new design from the collection called Little Bites by Carrie Nelson for Miss Rosie's Quilt Co available here. Speck is also this month's quilt for the sew-a-long, Another Year of Schnibbles. Little Bites use 2 1/2" precut squares. Since I have been on a little quilt kick, I decided to make a mini version of Speck. I used leftover pieces of Old Glory Gatherings from Primitive Gatherings from my Old Glory Itty Bitty here. Then I added some reproduction fabric from my stash. It is always a great feeling to use up fabric on hand. My little version of Speck is around 14"x18" before the binding. I love how it turned out. You know I love anything patriotic, so this is right up my alley! I almost left it without borders because I liked it so well. The pattern was super easy to follow. It went together very easily by following the pressing instructions given by Carrie. One thing I want to add...I sized all my fabric with Magic Spray Sizing, including the 2 1/2" pieces before I cut them. I always spray size fabric before I cut it. I know Carrie usually likes to starch or size her fabrics too, so I emailed her and asked her if she did when piecing with the 2 1/2 charms as well and she said "yes." That is the wonderful thing with Carrie's patterns using precuts, she always factors in any shrinkage you will get from pre-sizing/starching fabric. Here is my little trick when using sizing... I like to spray all my precuts or fabric generously. I will let them dry down a bit and then iron them. The fabric irons so much faster if you let it dry a little first. :-) I like the body the sizing adds to the fabric. Makes it super easy to handle for cutting. Also my piecing is so much more accurate with pre-sized fabric. Make sure you stop by Sinta's blog or Sherri's blog later today to see this month's parade of Speck quilts. 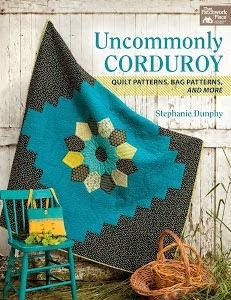 Terrific little quilt. I heart October best of all. Good tip on the pre-cuts. I do wish they were true to size though. 5" charm squares are not all created equal. I agree with you and October in Michigan is always great. Your quilt is very cute. 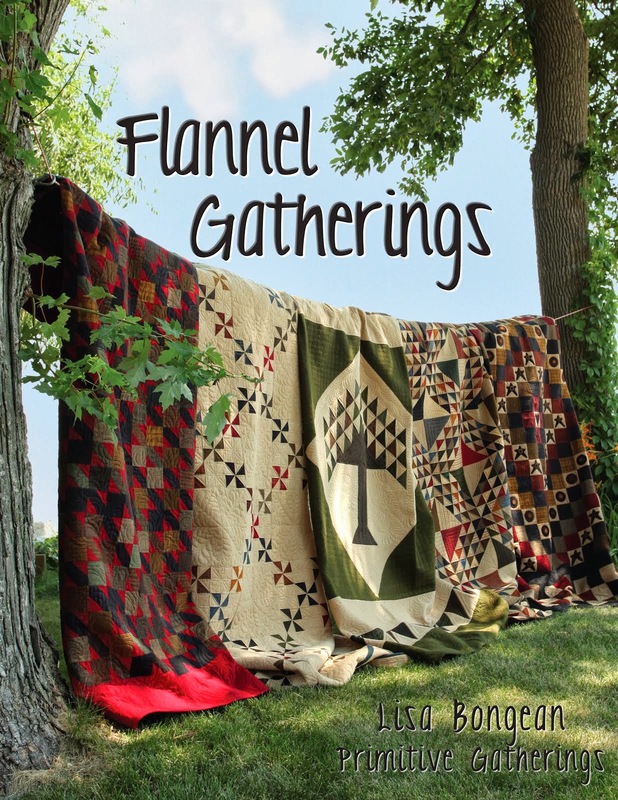 I also saw that you got your table runner quilted with a really cute swirl pattern. I love it. 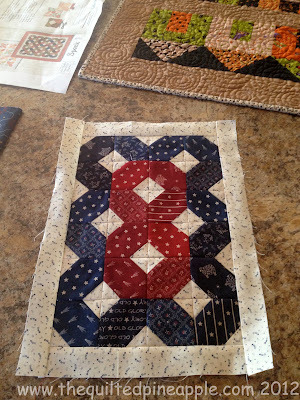 I am hoping to get my table runner done by the end of the week! Love your little Speck! That size always is so useful as a table topper or candle mat. Wish I had made one in September too. 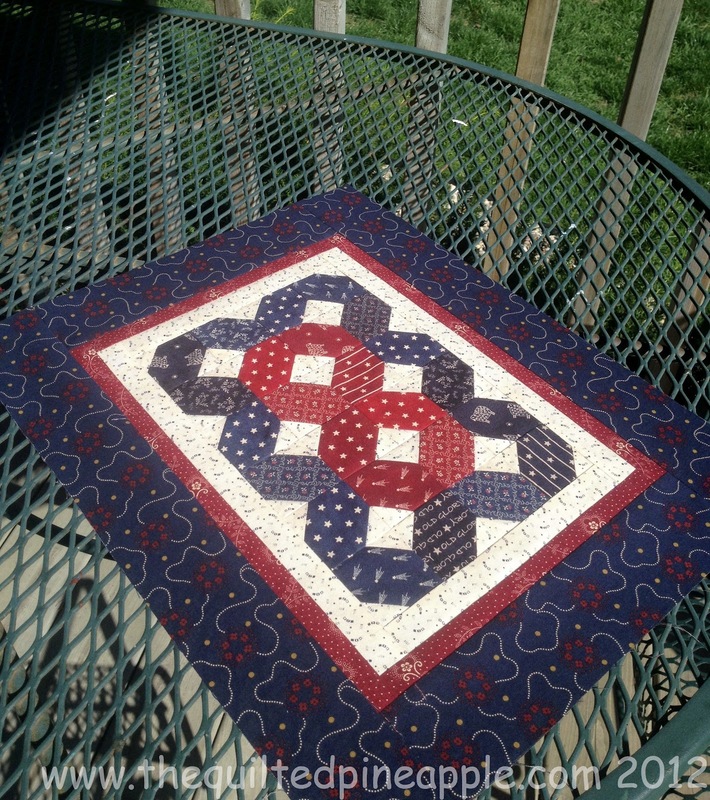 That is a beautiful piece, small quilts are fun to make and nice to have them done in a day. I LOVE your Speck! It's just wonderful! Thanks for the letting the sizing dry a bit before ironing...I always starch or size before I cut so I'll be giving that a try. Your patriotic Speck is so cute! I just started using Magic Spray Sizing on my fabric and I think it makes a big difference in the accuracy when cutting. I like your idea of letting it dry a bit before ironing! Thanks for the tip! LOVE your little Speck. It's adorable. Oh Linda that's adorable - well done!!! So October is your favorite month - you DO know the high's will be in the 50's this weekend, right? I'm ready to turn the clock back to June! 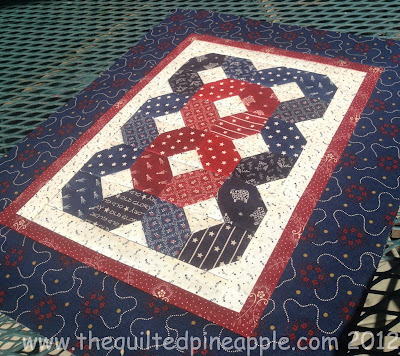 Your Speck quilt is gorgeous. Well done! I love this, but then I think you could have guessed that I would... I love how you used the red in the center. Thanks for the tips about sizing, too. Speck is adorable! I love making small quilts myself. I love the reds and blues you used. It's so cute! Love how it turned out! Love the small size too! I love your Speck! It's quite lovely. I always size my fabrics before cutting them too. It helps a whole lot. Very cute! I love the small size too...have a great day!! Just wondering, how do you join the another year of schnibbles? Love your little patriotic quilt. Thank you, Rose! You are a no-reply blogger so I have no way of emailing you back. All you have to do to participate is complete the chosen quiltt and email a photo of it and your info to Sinta and Sherri before the first of the month. Easy peasy. The next Schnibble is for the parade Nov 1st. The project is your choice of Bounce or Hubble. Wow - love it, Linda! 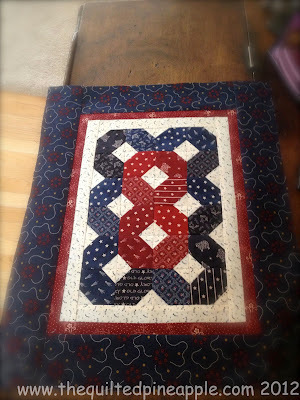 You have gotten me bit by the little quilt bug! Hi Linda. 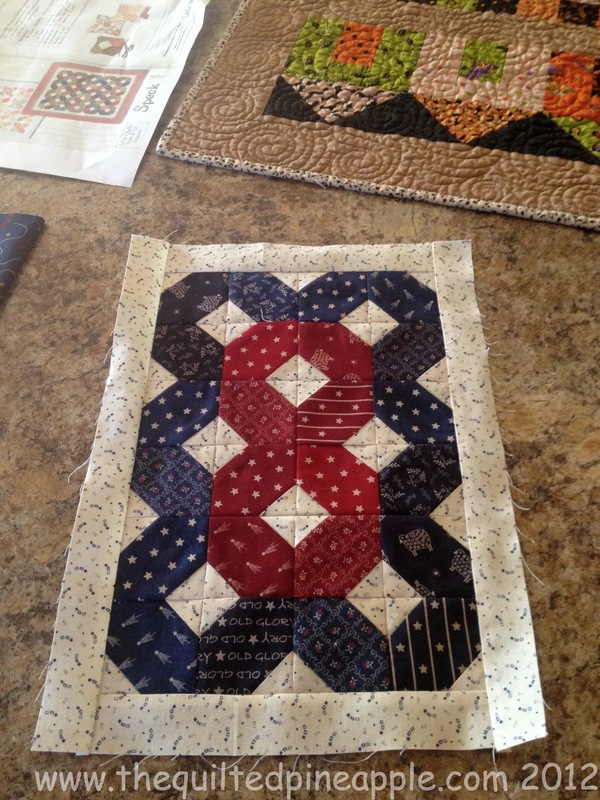 Beautiful little quilt!! (I saw it earlier today in the Schnibbles parade, and loved it right then and there). Thanks for the tips about using the spray sizing - I always forget to do that step, but I know that it helps alot. I agree, Michigan is beautiful in the Autumn, and it seems particulary lovely this year. My husband and I drove to Grand Rapids to visit Art Prize today, and the colors between Lansing and GR were awesome! Enjoy!! Thank you Margaret for your kind comments regarding Speck!!! I like to size my fabric as soon as I bring it home. That way it's ready when I need it. Art Prize is so cool. The weather has been great for walking around Grand Rapids. I am replying here because you are a noreply blogger. Thanks, Linda. I didn't realize that I was a non-reply blogger. I guess I thought that having a google acct meant that I would not be a non-reply blogger, but I guess not. Fun! I cannot get into the habit of sizing all my fabric, but I really should. I think of you every time I am! Great job on this little quilt. Lovely! I like how you arranged the colors Linda :-) Enjoy fall in Michigan! I do enjoy living in Florida, but there is nothing like fall in the north. Boy do I miss seeing the leaves change! Wow it sure looks great!